Chabot’s three large historic telescopes offer a unique way to experience the awe and wonder of the Universe. Check out celestial viewing day and night. Our observatory deck offers breathtaking views 1,500 feet above the Bay. The observatories at Chabot Space & Science Center are located 37.819 degrees North latitude and 122.182 degrees West longitude. Visit the Weather Station to view the current conditions. The telescopes will be closed on Christmas Eve, Christmas Day, and New Years Eve. Experience spectacular night sky viewing. Use the outside gate around the back of the Center. Follow the signs to the observatory entrance gate. General Admission guests are welcome to access the telescopes through Gruener Astronomy Hall with in and out privileges. 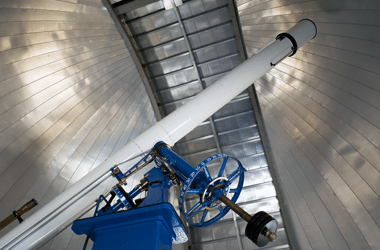 The telescopes are open during Center visiting hours, weather permitting. At Chabot, when the Sun’s up, the Sun comes out! With a spectrum of solar viewing aids, including Sun-watching scopes and filters as well as near-live satellite images and movies, explore the many faces of Earth’s star. Sunspots, prominences, flares, and coronal mass ejections are all living solar events that you may witness personally. Chabot volunteers and staff will guide you through your personal solar experience, helping to give you a new appreciation of the power, the magnitude, and the sheer beauty of the Sun. Contact the box office for current viewing status. Chabot’s houses three telescopes on its observatory deck. 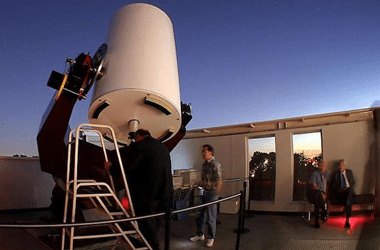 Nellie, Chabot‘s most powerful telescope, is a 36 inch reflector telescope, housed in a rolling roof observatory that allows access to 180 degrees of sky. This modern, research-quality telescope offers breathtaking views of the cosmos. The impressive 20 inch telescope, named Rachel, is the largest refractor in the western United States regularly open to the public. 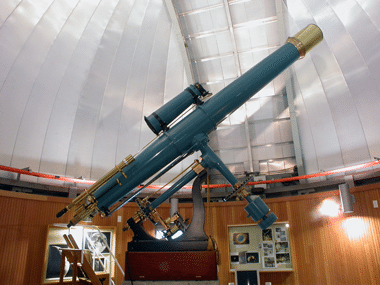 Its companion, the 8 inch Alvan Clark refractor, named Leah, is the original 1883 instrument donated by founder Anthony Chabot. Chabot’s historic 8″ Alvan Clark refractor telescope is the original 1883 instrument donated by founder Anthony Chabot. In 1883, Anthony Chabot, a successful hydraulic engineer and provider of water to the City of Oakland, agreed to fund an 8-inch telescope. Mr. Chabot subsequently funded the new observatory as well, which opened in downtown Oakland on November 24th of the same year. Chabot’s historic 20″ Warner and Swasey refracting telescope, installed at Chabot Observatory in 1915, was commissioned in 1914 from Warner & Swasey, with optics by John Brashear. This telescope was named “Rachel.” In June 1999, Rachel was removed from the site where she had served the public for 75 years. Extensive dismantling, cleaning, and refurbishment were performed. Early in 2000, Rachel was installed in her new dome at the new Chabot Space & Science Center. Chabot’s new 36” reflector, “Nellie,” is housed in a rolling roof observatory, allowing access to 180 degrees of sky. This modern, research-quality telescope offers breathtaking views of the cosmos.